By Meredith Talusan (BuzzFeed News Reporter) Jacob Tobia (BuzzFeed Contributor) Tiq Milan (BuzzFeed Contributor) NicoFonseca (BuzzFeed Contributor). Article originally posted on Buzzfeed. Meredith: Welcome everyone. I’ve gathered us all here to talk about gender dysphoria, and specifically the model that has become the most prevalent in the trans community: that trans people feel like they were born in the wrong body from early childhood. It’s an idea that’s prevalent in a lot of movies and literature, and is also an important way that medical professionals often assess whether to give people access to trans-related medical care. So my first question is, does this model resonate with you? Also, you can introduce yourself and how you identify and your pronouns and all that. Nico: I’m a gender variant queer fat femme from Brooklyn, my pronouns are he, and they. 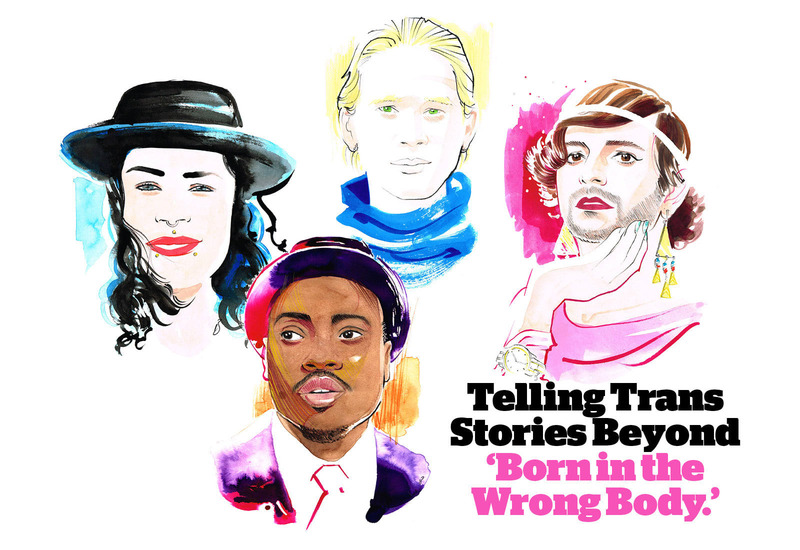 I don’t identify with the model of having been born in the wrong body in order to be trans. Growing up as a fat queer person, my body has always been something I should not be allowed to identify with, love, or accept. Being trans meant that too. The more I wanted to explore my body, and push the socially imposed boundaries of presentation, the more I was encouraged to explore a hypermasculinity in order to validate myself, my identities and my journey. For me, coming into myself is to unapologetically let myself be what I want to — the radical self-determination and to reclaim the agency over my body, my hair, my voice, and my skin. Jacob: I’m a genderqueer femme from North Carolina who’s now living in NY and trying to pretend like I’m a city mouse, and my pronouns are they/them. The “traditional” model of trans identity — the idea that trans people have to feel like we’re in the wrong body — really got in the way of me understanding myself as trans. For the longest time, I didn’t think that I counted as trans because I thought you had to hate your body in order to be part of the trans community. Standing in front of the mirror, all on my own, without anyone to judge me, I’m not sure if I’ve ever really had an issue with my body. Tiq: I identify as a trans man, pronouns he and him. I’m a writer, media maker, and trans rights advocate. The idea that being born in the wrong body seems to be the most commonly used and most simplistic way of explaining the transgender experience, but it never really fit my narrative. I never felt I was born in the wrong body, I just evolved away from it. Meredith: To answer my own question, I’m a medically-transitioned nonbinary trans woman (they/them or she/her pronouns) and I don’t really resonate with this model. I didn’t feel particularly alienated with my body until I started presenting as female, and even then, it was more about how other people perceived me rather than some deep-seated sense that my body felt wrong. Tiq: Did you all recognize being trans at a young age? Could you name that you were transgender or did it manifest as something different? Jacob: When I was a kid, I didn’t know the word trans or anything. And I didn’t really feel like a boy or a girl per se. I just had like WAY TOO MUCH gender. I had gender pouring out of my ears. I wanted all the butch things and the femme things and everything in between (although I never got the violent/aggressive thing that so many young boys do). I just wanted to play with bugs and make cakes in my Easy Bake Oven and roll around in the mud in a tutu all at the same time, y’know? Nico: No I definitely didn’t recognize being trans as being trans, that’s for sure. I really just felt like I was so many things and the words I had access to didn’t suffice to capture it. So for a long time, I just didn’t really place a lot of value in words to identify myself. Meredith: Me neither, and over the years I’ve been encouraged to think this was some sort of false consciousness, that somehow I unconsciously knew I’m trans and just didn’t recognize it. And I’ve realized over time that doesn’t really resonate with me. I was who I was pre-transition – a third-gender kid in the Philippines, a gay man in the States for a certain period of time, then a binary trans woman, and now a nonbinary transfemme. I really honor all of those identities and don’t think of them as being stepping stones towards some sort of ultimate state. I’m just a person who changes over time and feels differently about myself, and that’s fine. Tiq: I didn’t know I was transgender. And the only reason I knew I was “a girl” was because I wasn’t allowed to do what the boys did. I couldn’t ride my bike to the park. I got in trouble for climbing trees and messing up my hair. I had to cross my legs and not get dirty. Being a girl was about limiting my body under the guise of protecting me. I associated being free and uninhibited with being a boy, and that was my first introduction to the gender binary. I think if I had the language or knew that being a trans boy was a possibility, I would have come to that truth much sooner.